Which auto brand do truck enthusiasts trust and admire the most when it comes to manufacturing tough, work-ready pickup trucks? The same brand that truck fans in the Pittsburgh area admire: Ford. Kelley Blue Book’s KBB.com just honored Ford with the ‘Best Overall Truck Brand’ award during their Brand Imagine Awards. Ford is no stranger to earning the prestigious ‘Best Overall Truck Brand’ title; 2016 marks the third year in a row they have captured the top spot. In fact, of the eight times Kelley Blue Book has presented ‘Best Overall Truck Brand,’ Ford has nabbed the award seven times. The 2016 Ford F-150 full-sized pickup undoubtedly helped Ford clinch this year’s title, as it packs in a lineup of features that drivers will not find anywhere else. Here are just a few of the innovative performance, tech, and safety features that set the 2016 Ford F-150 apart from the pack. Segment-first Pro Trailer Backup Assist™ helps any driver back up a trailer by simply rotating a knob left or right. An advanced rear-view camera provides a clear view to make reversing a trailer intuitive. Only the Ford F-150 offers this innovative tech feature. 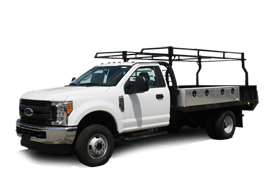 Best-in-class payload rating of up to 3,270 lbs. and a class-defining pickup bed make the 2016 Ford F-150 ready to tackle any task. The class-exclusive BoxLink™ system offers a reshaped pickup box for maximum usability. Four interface plates make the box customizable with accessories for storage, and four lockable cleats provide locations to securely tie down cargo. 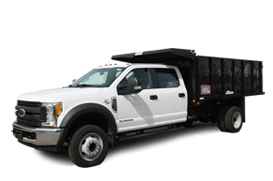 Explore the new commercial truck inventory at our commercial truck and truck body dealership in Pittsburgh, PA to browse available upfit and custom build options. 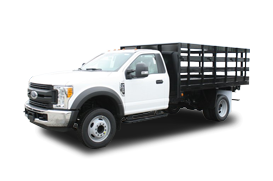 From the current F-Series lineup to upfitted commercial vans, our team is committed to delivering the vehicles that fleets and businesses in the Pittsburgh area rely on. Call us at (855) 996-0725 to speak with a product specialist, or contact us through our website.